1. The real technology is in the Bosch controller, which manages use of the battery, charging and showing information about the batteries on the dashboard. This means it cannot be retrofitted to an earlier Bosch system yet. 2. It doesn’t connect the batteries in parallel, it switches to a battery and uses 10% of power, then switches to the other battery and uses 10% and repeats. This is designed to make sure a battery does not get too “tired” and can recover somewhat before being used again. This will extend the short term range of the two batteries, apparently more than doubling the range of a single battery, and presumably will also extend the life of the cells in the batteries. This is great, but I cannot afford a bike with a Bosch system, especially as I have only just built my latest Bafang based bike. So what do I want this dual battery system to do? 1. 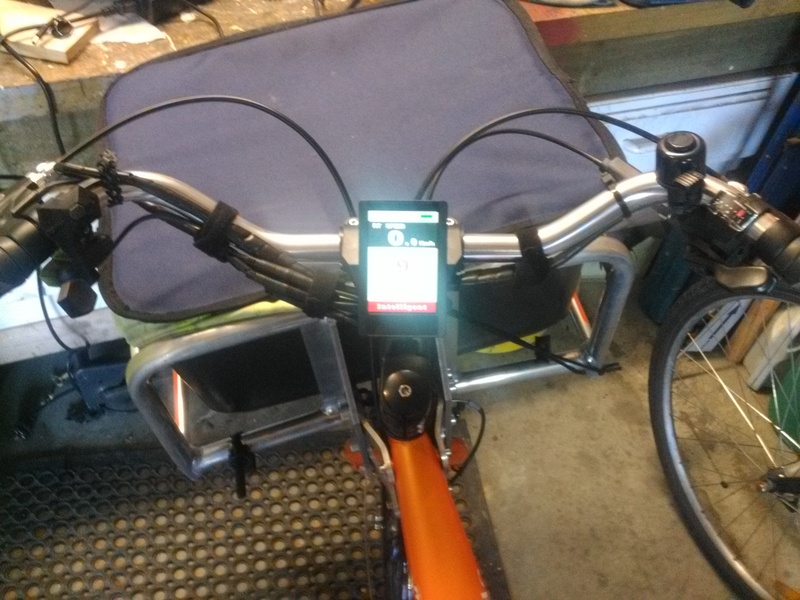 I want both batteries to be physically attached for the whole ride, no stopping to physically swap cables etc. 2. I want the system to automatically swap the connection from one battery to another on the fly – no loss of power, no stopping to flick a switch etc. This means it will need to “make before break” – connect the next battery, and when connected, disconnect the previous battery so that it can rest. If a batteries voltage is less than the battery currently in use, the system will stay with the current battery. 3. It must cope with only one battery being connected at a time, or both. 4. There must be no connection between the two batteries while in use, other than the momentary “make before break”, so that the batteries do not attempt to equalize their states of charge. 5. The system shall be self powered by one or other of the attached batteries, no extra connection or battery will be necessary. 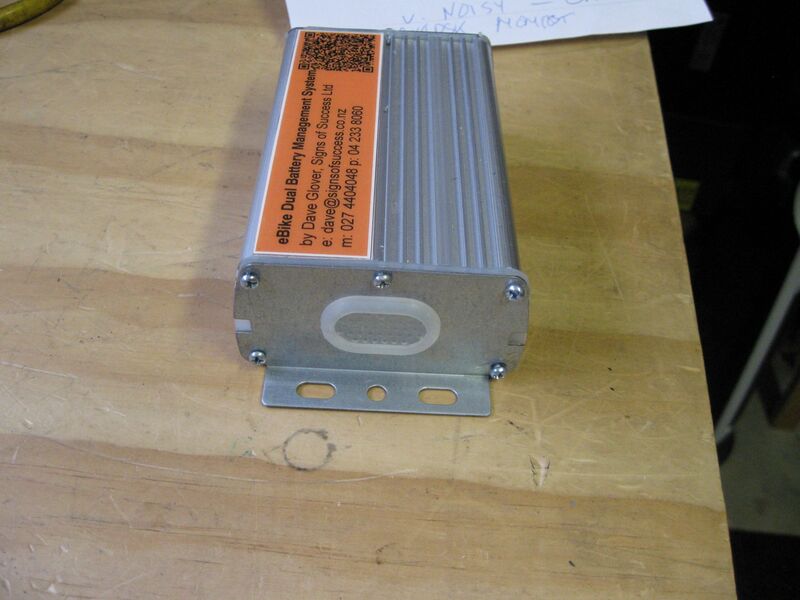 Battery equalization through this power supply is to be avoided. 6. This is a development platform, the battery swap time, the delay between make and break and the swap algorithm should be easily reprogrammed. 7. 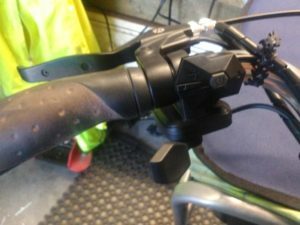 It should look good on the bike, and be completely weatherproof, using the Lekkie/Bafang weatherproof connectors used to connect the motor and battery on a standard system. 8. Reverting back to a single battery should be easy and free – no damage to existing components. How do I propose to achieve all this? For the working prototype I have the following ideas. Obviously some reasonably simple control is required, I will use an Arduino micro processor to run a simple C program. I have experience of C on the Arduino, I have two development platforms I can develop and test the components on, and tiny versions are available which take up very little room, yet do everything I need them to do. Arduino devices run on 5v (or 3.3v) power, and this can be supplied directly to the board via the headers, or can be supplied via a micro USB plug. To run this off the bike batteries I will need two things. The first is a DC-DC voltage converter, with an input voltage that can cope with a variety of batteries in various states of charge (12s – 41v to 33v, other batteries up to 60v). These converters are readily available. The second is a pair of diodes (or a single diode with two cathodes) so that both batteries can be connected to the input of the voltage converter, without the higher voltage battery trying to charge the lower voltage battery. 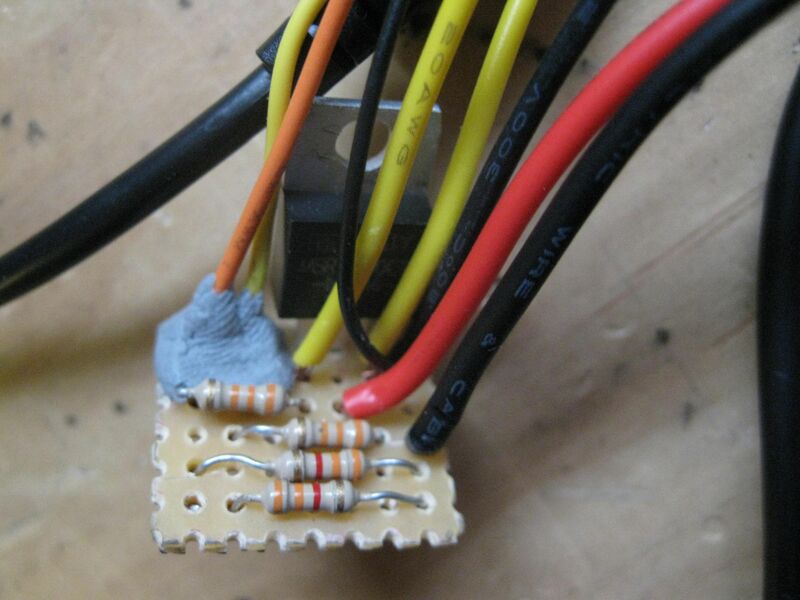 I have a diode rated at up to 100v (60v RMS) and runs at 20A, with a 150A surge, which should cover all bases! 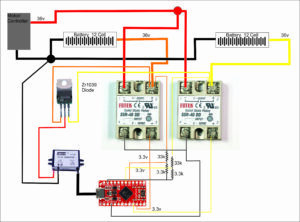 The Arduino program will use two digital output pins to control two solid state relays (SSR). These SSRs optically isolate the high voltage circuit from the low voltage circuit allowing the relays to be used on the battery positives. They also stop any back flow from one battery to another. Other solutions using MOSFETs have issues with common grounds etc. In addition, the SSRs come ready built, just plug and play. I am using 100v 40 amp relays, to give a bit of leeway (maximum voltage should be about 42V, maximum current should be about 18A). 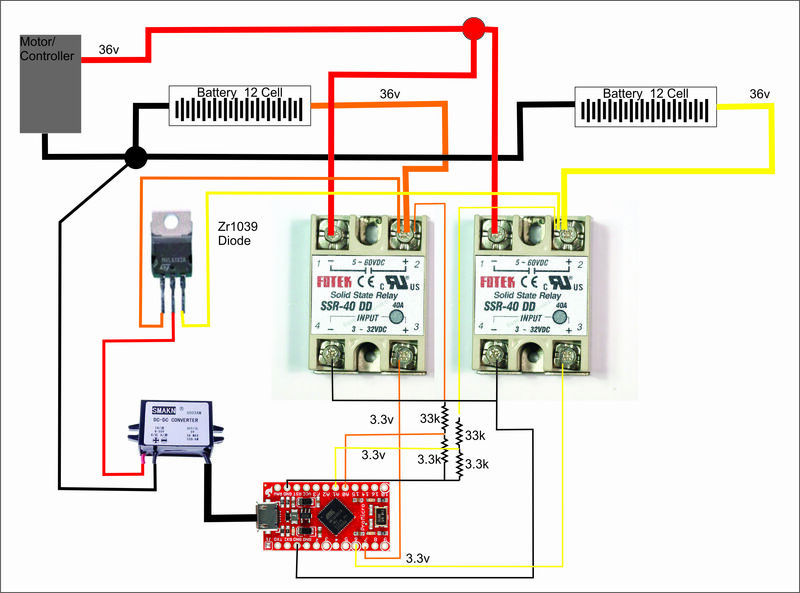 In order for the Arduino to measure the state of charge of each battery, analog pins on the Arduino will be connected to the positives of each battery. Arduino analog pins have a maximum voltage of 5V, so voltage splitters will be added to reduce the voltage to under 5v, I will be using an 11 to 1 ratio between input and output, so 44v will be reduced to 4v for the Arduino. The program on the Arduino is quite simple (at the moment). 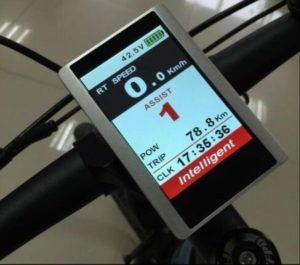 Every 5 or 10 minutes (to be decided) the program will read the voltage of both inputs, and whichever has the highest value will be connected as the next battery, and after a short pause for the relay to do its work (10ms) the previous battery will be disconnected. If a battery is faulty or not connected, the voltage test will ensure that only the working or attached battery will be selected. 10% of usage on my batteries is between 7 and 9 minutes, so a simple timer will have a similar effect to using power meters to decide when to swap. Because the unit will have no switch, it will activate as soon a the first battery is attached, and that battery will be the selected battery. An initial pause of 30 seconds before the first automatic switch will allow both batteries to be connected, and the highest voltage battery to be used. For a weatherproof case, I have a few spare controllers for use with Bafang rear or front wheel motors, one or two of which are not particularly useful. They do have excellent silicon gaskets to provide full weatherproofing, and are also aluminium extrusion which is designed to act as a heat sink for any hot components attached inside. As both relays and the rectifier diode being used on the power converted are designed to be attached to heat sinks, this saves me having to make anything else up. Matching up sizes of components and the case, all components should just fit into the case. 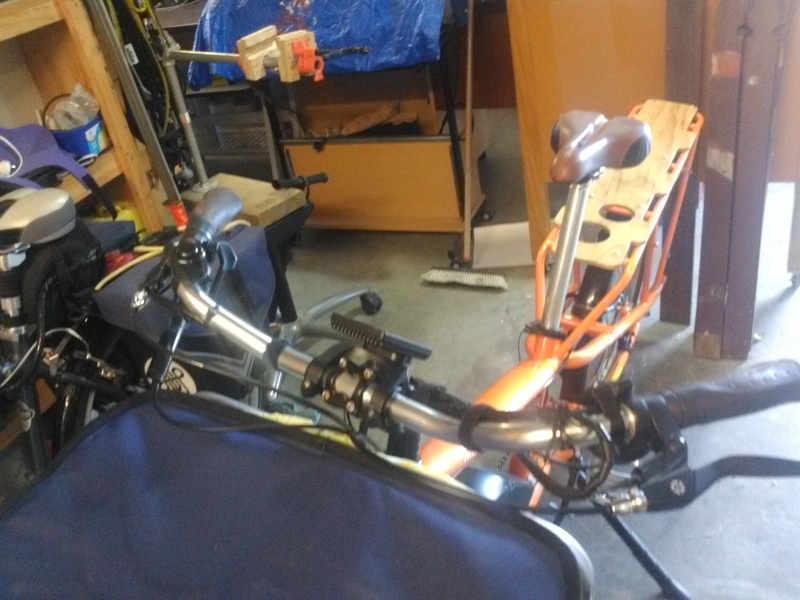 The case has mounting points for easy attachment to the bike. 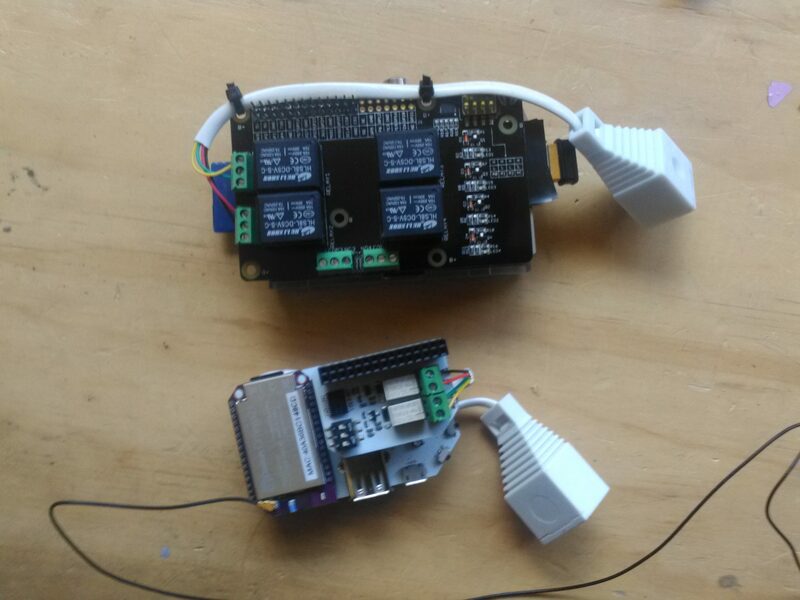 The power converter will be plugged into the Arduino board via a USB plug. This will be easily reached just inside one of the end plates of the aluminium case. 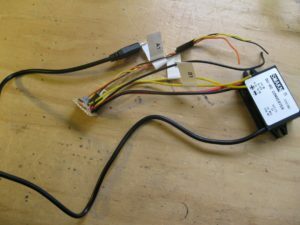 If I want to reprogram the Arduino, I can attach a programming cable to the same port, and update the code as required. I have purchased two Lekkie battery extension cables. This gives me two of each type of connector. The input to the DBMS will be two battery sockets, as found on the Lekkie/Bafang motor, the batteries will plug into these sockets. The output will be a single battery plug, as found on the Lekkie battery that came with the kit, this will plug into the Bafang motor instead of the single battery. This leaves me with a single battery plug, which I will attach via an adapter to the XT90 connector currently on my self built headway battery. At $16 for each cable, these provide a standard connection method, so adding or changing batteries later is easy, and the connections are waterproof. Early days yet, most parts are ordered, a small circuit board for the power supply diodes and the voltage splitters has been built. This post may take a few days, so keep coming back! Some background first. I repair computers, and a few customers (3 or 4) have been hit by the “Windows Corporation” scam, where someone thief rings up with a very Indian accent, but with a very English name, claiming to be from the Windows Corporation, or Microsoft, and tells the victim that their PC has been infected with malware and is busy infecting others and other bad things. Most people are not taken in by this but some customers get confused, maybe they have just seen an adware or malware message on their PC, or have just changed email addresses, or are not well at the time, and they are taken in to some extent. Most don’t actually pay these thieves any money, claiming to not have a credit card and are housebound etc. But by the time they get to this stage, the damage has been done. Next time they log on, the system asks for a Startup Password, which they of course don’t know. Soon after they get the second call from the thieves telling them what has happened and how much they have to pay. Fortunately for some, they call me rather than pay the thieves. I have a couple of effective solutions to unlocking the ransomed PCs in this case, and it normally takes just 30 minutes to undo the damage. Strangely, I am also on every single list there is for these people, and I get several phone calls a week from similar callers. Because my home phone is forwarded to my cellphone, I can ignore them most of the time, but occasionally I get to the home phone in time and field the call. At first I called them names, or led them on and then told them they were stupid and hung up, but more recently I have decided to find out more about the scam and have been actively using the calls to get more information. It takes a good 30 minutes of my time, but some days I can spare it! To this end I have a “disposable” PC set up with nothing on it, which has no access to the rest of my network. So, how do these calls go? The opening blurb is much the same, introduces themselves with an English name (Jack Dawson was the latest, and the technician was Will Harris or something similar). They tell me that my PC has been monitored and has malware infections and has been doing all sorts of things, all of which are bad. This is designed to scare and confuse. I am told to get to a PC and switch it on, and pestered until I say it is on. In the meantime, they are asking questions about who uses the computer, how old it is, and whether I use it for secure applications, such as banking, shopping etc. When the computer is going, they ask which key is at the bottom left of the keyboard, and then which key is next to it. They are obviously finding out if the keyboard has a windows key, but depending on the answers could be gauging the level of knowledge of the victim. When answering these questions I have been a bit silly in the past, if I want to trap these people better, I need to pretend I know nothing about computers, but that I do internet banking with three banks, manage my stock portfolio and keep my bitcoin wallet on there! Any way, once they know the keyboard layout, the fear and confusion continues. I am told to press the Windows key and hold it, then press the “r” key, and am asked what I see on the screen now. What you see of course is the run dialog box, and I am then asked whether the box on it is empty. The thief then asks you to type in, one letter at a time (e for elephant, v for victor, e for elephant again etc) the word “eventvrw’, and as with all steps below, I am asked what I see now. From here I am told to click on Custom Views in the left pane, then Administrative Events in the middle pane, and am asked what I see, which of course is red exclamation marks and yellow warning triangles with hundreds of errors. When I admit I don’t know what these are, they are described in gory detail as errors caused by all the bad software on my PC, and how only they can fix it. This spiel can take many minutes! So having agreed that this is very bad and should be fixed, the thief offers to fix them for me. OK says I, let’s do it! So, Windows R again, and www.1234computer.com in the white box. I have complained to the powers that be about this website, so it may be something different when you get your call! Of course this starts up a web browser with a quite sophisticated web page on it, very little of which actually works. At the bottom of the page are four flashing buttons labelled Server One, Two, Three and Four. Clicking on Server One starts a download of Teamviewer. All this is done while comforting words about how normal all this is and how it will help get rid of the malware. Teamviewer is a legitimate application, which is used to give people you trust access to your computer, so that they can fix errors on it etc. Some computer technicians use this a lot rather than travel to customers sites. Personally, I like the personal interaction occasionally. However, when thieves and scoundrels get access to it, they can do so much bad stuff to your PC. The other three buttons are links to alternatives to Teamviewer, like Supremo, ShowMyPc and AnyDesk. Other web pages such as AMMY.COM carry the same links. So OK and download are clicked as requested, and TeamViewer downloads, installs and runs for the first time all with no further intervention. After describing what I see, it is explained that I am going to give their technician access to my computer. This is the clever bit, I thought they would ask for the partner ID and password that is shown on the left of the TeamViewer screen, but what they actually do is give the victim the Partner ID and password generated on their technicians PC by team viewer. Now this would normally give me control of their computer, but a menu appears at the top of the screen, and I have to select/click the “Switch sides” button, which then gives them access to my desktop. At this point I am handed over to a technician on the phone. The technician starts by repeating the eventvrw demonstration, adding the technical confusion to what the first guy said. He then uses Windows R and types in “inf”. This displays the contents of the /windows/system32/inf directory, which I never seen before. He then asks if I recognize any of these folders and files, to which I answer, honestly for the first time, “No”. Finally, he gets up a list of services, and explains that some of these services are stopped. Yes, I agreed. He then asks me to scroll down and see how many there are. I declined, saying I believed him, but then he came over all “school teacher”ish, and insisted I scroll down through the list and counted them one by one out loud! I gave him a not so small piece of my mind about what I thought he could do with that idea, which he accepted and moved on from. Now, while continuing to talk about malware, stopped services etc. once again I saw the run dialog appear, and the word syskey typed in. Syskey would normally allow him to encrypt a very important part of the file system, and add a password to the encryption so that the computer will not start without the password. Unfortunately for him, I recently upgraded this PC to the very latest version of Windows 10 – the Fall Creators update, aka 1709. 1709 has many improvements, but an interesting one is that SYSKEY no longer works on this version of windows! I watched him try a few more times in obvious confusion. In the meantime, the voice changed again, and I started to get the hard sell, that they would repair and maintain my PC for a payment of just $400 odd dollars, and how would I like to pay. I was going to go through the process and pull out at the last minute of give false credit card details when I realised I would be wasting my time, because they had no leverage over me (they could not hold my computer to ransom) they would just give up and not ring back. So I switched off the router and hung up before they got malicious and started deleting files etc. So the anatomy of a scam is not complete, I need to take it to the point where they think they can ransom my PC, i.e where SYSKEY was successful. I have two options, firstly I just finished building a Windows 7 Pro pc up from a cast off by a local business, and I could sacrifice that, allowing them to really use SYSKEY and lock it up. I would have no problems unlocking it. Secondly and much more fun, I have developed a Windows application that exactly mimics the windows and navigation flow of the SYSKEY application. This took a few hours of development, it is just two screens and a couple of message dialogs, with radio buttons and buttons to navigate by. The main difference is that instead of encrypting the SAM hive file and adding a start up password, it just records the password on a text file. There is no real indication that it is not the real thing. This program has been compiled into an .exe file, and it is just placed into the c:/windows/system32 folder, and it will run just like the real thing. Download a copy of the fake syskey in zip format here. Of course you could use this to replace the real syskey on any computer, just back up the original and replace it with the fake. You will need a folder c:\secret to store the password file in, otherwise the program will fail with a suspicious error message. Test it before you use it for real, to make sure it is allowed to run by windows, but set the password to spaces before letting a scammer loose on your PC. This program displays the password if you need to demonstrate it to a scammer, all in the spirit of good fun of course. I leave it on the desktop, if no password exists it doesn’t do much, if one does exist it shows it. So now I am just waiting for the next call! I watched a video recently about scam baiting (one of thousands out there), and I am pretty certain it was the same guy as I dealt with, same script delivered in the same way, same web site, and the same method of using Teamviewer. The scambaiter didn’t click on the switch sides button, instead he clicked on actions/disable remote input, then attempted a syskey on the scammer. The scammer was immediately suspicious and disconnected the connection to his computer pretty quickly (I would switch the router off – by far the quickest option). I just tried it on my workshop machines, and if you worked really quickly you might just get away with it, the trick is to say the right things while you are doing it, the scammer can’t see what you are doing, but neither can he move his mouse or use his keyboard. Maybe something along the lines of “Hey, my Teamviewer has locked up, how about yours?”. Maybe I will try that in subsequent calls, or maybe after they have attempted a syskey on me! 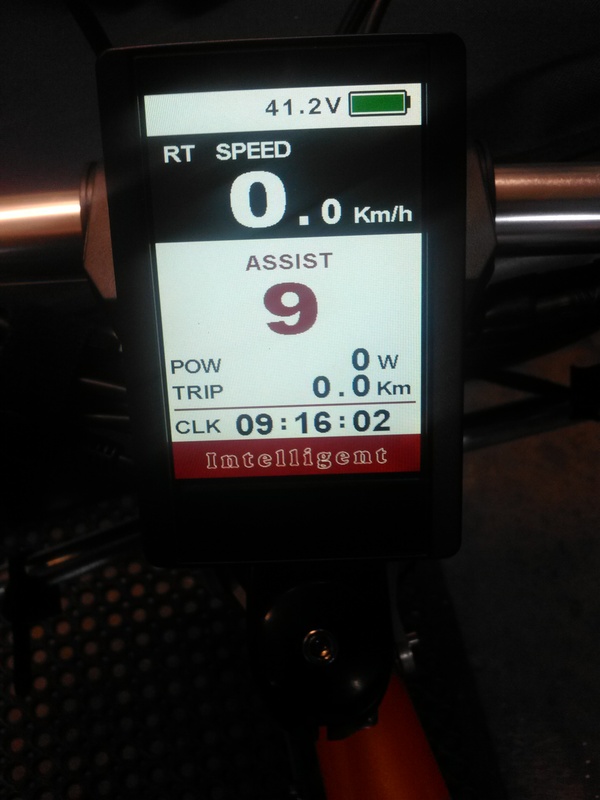 After just a couple of hundred kilometres, the main display unit described below stopped working correctly. It bega with it occasionally not switching on first time, needing a repeat try, and this gradually got worse until it was taking 6 or 7 tries to get it switched on. Eventually it reached the point where it would just not start most of the time. In amongst this, occasionally it would start with psychedelic patterns on the screen multi coloured bars and stripes flickering, and only a full power down would fix it. I checked the switch unit (which is just that inside – no electronics). I used a multimeter across the contacts, all was good. Contacted the supplier, PSPower, who wanted me to pay postage back to china, lie about the worth of the device, pay any tax they were changed by customs, and pay a US$20 postage and packaging to have it returned. For this they would send it to the factory to have it repaired. 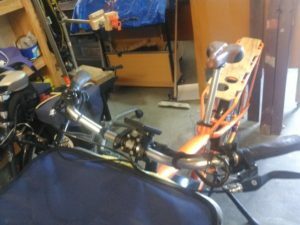 I have never been really happy with PSPower’s service, even when they were E-Life Bikes, so may not be using them again. 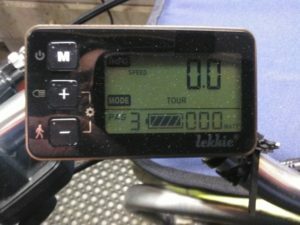 Fortunately the display that came with the Leckie kit still works fine, so am going with slightly less bling and features for now! Shame, I really liked that display! Despite the issues with bricking the device and it recovering itself in a random state, I decided to go with what I had rather than risk bricking it again. This caused a few issues, but I can live with them. Below are the steps and some notes about how things went.In the picture below is the complete Raspberry Pi installation, below it the compete Omega installation. Connect the computer you are using to the new wifi network that has appeared in your list, in my case it was called Omega-48CD. The 48CD part is the last 4 characters of the MAC address. The default password is 12345678. The Omega is acting as an access point (AP). Use a browser to log on to http://omega-48cd.local. The Omega set up wizard will start, and you can go through the set up process – login, wifi, update software, install console and latest firwmare updates. When Omega is rebooted, use a browser to go to http://omega-48cd.local again and log in to console using “root” and “onioneer”. In general settings, change the password for “root”, change access point password, check for firmware upgrade again. In order to install all the software I required to create the Garage Door opener, I was probably going to need more than 32MB of storage. I bought the Omega 2+ because it had a built in Micro SD card slot, which can be used to extend the onboard storage. I have a 4GB Micro SD card which seemed ideal, so I put it into the Omega 2+, and changed system to boot from it. Full details can be found here on the Onion Omega 2 Documentation pages Make sure you follow the instructions exactly, especially when changing the config file, a mistake in the overlay line just stops it working. I am a PHP programmer, not a python programmer, so I want to use PHP to process my web pages. In fact, I intended to use exactly the same code as I used on the PI wherever I could. I needed to install PHP as detailed in the documentation pages. 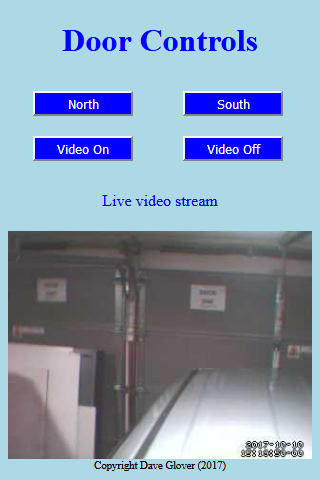 I don’t need to install a web server, as the Omega comes with its own light weght one installed. Much as I want to use PHP, somethings have to be done in Python or C. I dislike C more than Python, so I used this page to install python light. No need for the full version, the sole use is for the relay expansion. In order to control the relays on the relay board, I needed to install the relay expansion python module. This is a Python script which may use a C program, and it delivers functions to initiate the relays, and to set them on and off. These can be called in small python scripts I have to write, which in turn will be called from my PHP code. change ip address to static by editing /etc/config/network with (my settings – use your own based on your router). The last line seems quite important, I didn’t need it on the PI changes, but the Omega won’t work without it. where 192.168.1.99 is the fixed IP address set up above, and 8080 is the port allocated in the /etc/config/mjpg-streamer. The camera and the Omega work really well together, and seem to cope with low light a lot better. Set up python scripts to flick relays on and off. These are based on the routines I set up for use on the PI, but the functions called are a little different. The lines in red check to see if the relays are initialised, and if they aren’t, initialises them The code in blue sets the channel zero relay on, then 0.2 seconds later, sets it off. The addr value of 7 is the hardware address of the relay board. If I added more relay boards, each would need a different address. A similar script does the same for the channel one relay. As mentioned above, I used the PHP script to generate the web page that I created for the Raspberry Pi version, This needed very little modification. Below is the PHP portion of the code, with the changed lines highlighted. Executing the Python scripts in PHP is much easier, no need to use Sudo, and no need to give the PHP program god rights to use Sudo without a password! The video live stream is discussed above. With it all set and tested on the bench, the Omega was attached to a 4 pin socket for the relay connection, a wifi antenna was attached just to make sure, and the camera on the ceiling was changed to the new Logitech camera, and connected to the Omega. 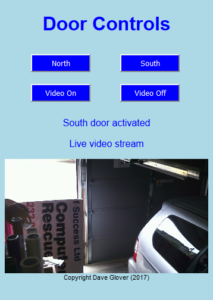 Power was applied, and the new Omega garage door opener was up and running.A step by step, feature by feature comparison with the Raspberry PI will follow. First impressions are that they are fairly evenly matched, with specific difficulties and features in each device.